The splash of light in the center of North America at night, seen from space, shines like the opposite of a black eye. It doesn’t mark a big city or conglomeration of cities like the other light spots across the continent. In fact, it’s coming from where there are few cities at all. 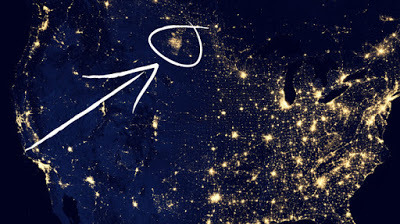 The bright spot is the oil patch in and around the Badlands in western North Dakota. It’s flaring of natural gas from oil rigs. It’s also cash disappearing, literally, into thin air. It’s the potential for thousands of jobs going up in smoke. It’s a resource that could help our nation be less dependent on foreign energy sources. It’s the atmosphere being polluted by dangerous methane and other toxins from an industry that comes in, tramples over a state’s public lands and ultimately leaves with millions and millions more in its stained pockets. Some of those millions make their way into the re-election coffers of members of Congress. These are members of Congress who – surprise, surprise – want to repeal the Bureau of Land Management (BLM) Methane and Natural Gas Waste Reduction Rule that curbs flaring and venting on public lands. Flaring refers to burning off natural gas that is a byproduct of fracking, and venting to releasing natural gas into the atmosphere. But the oil and gas industry doesn’t think so. It argues that forcing oil extractors to update equipment and technologies to capture and distribute the natural gas will be too costly and ultimately will make them less likely to keep extracting oil. If there’s oil to be got, those companies will be here to get it. They just don’t want to spend the money. Instead, they’d rather keep sending ours up in flames, along with public health and the health of the planet. 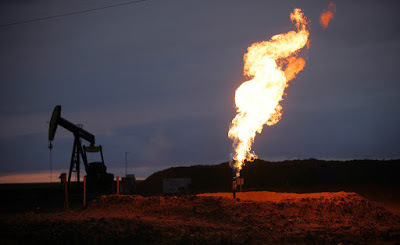 And members of Congress – mostly Republican, but a few Democrats, too – want to help them by repealing the Methane Flaring and Natural Gas Waste Reduction Rule. An in-depth analysis by ICF International estimates that fugitive and vented losses from oil and natural gas operations on federal and tribal lands amounted to over 65 billion cubic feet (Bcf) in 2013. This gas would be worth nearly $330 million at current prices. That’s $330 million of a TAXPAYER-OWNED resource that will go back to being burned off and released into the atmosphere by private, for-profit businesses. Taxpayers get ZERO return. The methane mitigation industry has been putting people to work in high-paying jobs, according to a study commissioned by the EDF and conducted by Datu Research, an international firm created by Duke University analysts. over $1 billion in lost product and reduce air pollution. Sounds like the kind of jobs we want in this country. Natural gas flaring and venting puts toxic chemicals into the air that we and our children and grandchildren breathe. Multiple sources discuss the negative health impacts of carcinogens, metals like arsenic, sour gases, nitrogen oxides, carbon dioxide and methane released through flaring and venting of natural gas. Autoimmune problems, asthma and other respiratory illnesses, cancer and premature death are a few of the related health issues that are often mentioned. Arsenic. Carcinogens. Cancer. Premature death. These are ugly words, especially in the context of preventable activities. Methane is a big part of natural gas. When it’s released into the atmosphere, it’s a greenhouse gas that accelerates global warming. The Intergovernmental Panel on Climate Change, cited in a piece in Scientific American, said methane warms Earth 86 times more than CO2. The negatives of CO2 in relation to atmospheric degradation are well documented. Administration would be eligible for consideration under the CRA. In layman’s terms, this means this Congress can repeal or overturn rules released near the end of President Barak Obama’s term. And they’re doing it like crazy. The worst part of the CRA? A rule repealed under this law cannot be implemented again in “substantially the same form.” Ever. Over and out. One Democrat who apparently is still “wavering” on how she’ll vote regarding the repeal of this rule is Sen. Heidi Heitkamp, who is from my home state. I grew up in the Badlands of North Dakota. I’ll never forget the gazillion stars and planets, satellites sailing along under the Milky Way, trailing across the dark night sky. I’d lie on my back in the campground across the Little Missouri River from the Burning Hills Amphitheater, watching in anticipation for the nightly fireworks that blasted over the crowd at the end of every Medora Musical performance. Those stars are harder to see these days, thanks to the air and light pollution from the flaring of natural gas on public lands in North Dakota and elsewhere. If Congress repeals this rule, it’ll be harder yet, and the negative impacts will be felt well beyond the borders of my state. Wherever you are, call your senators (here’s a list). In North Dakota: Sen. Heidi Heitkamp, 202-224-2043, and Sen. John Hoeven, 202-224-2551. Tell them to vote against air pollution, dangerous hydrocarbons, lost jobs and wasted funds. Tell them to vote against repeal of the BLM Methane and Natural Gas Waste Reduction Rule. In short, tell them to blow it out…. The gas.